Attribute 1: * 6.5mm .270 Cal. 7.62 Cal. .25 Cal. 7mm .45 Cal. .338 Cal. .303 Cal. .30 Cal. Inner Grooves - Strategically weaken the upper section of the jacket, ensuring consistent, controlled expansion, even at long range. Tapered Jacket - Jacket thickness is precisely controlled for expansion at all velocities. One-Piece Core - Does not separate like divided cores. 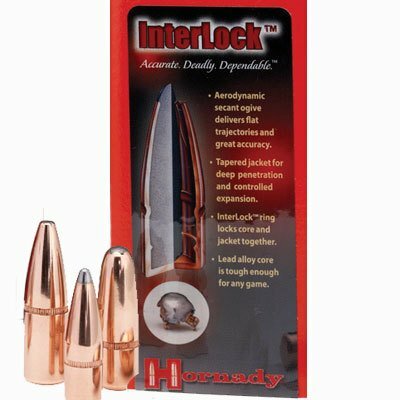 The InterLock® retains more mass and energy for deep penetration and large, consistent wound channels that ensure quick, clean kills. Cannelure - Provides accurate and consistent crimping and also works with InterLock® ring to ensure the core and jacket remain locked during expansion.